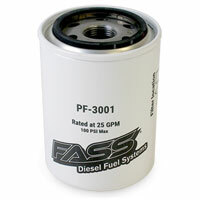 Many owners are concerned with fuel filtration and are wanting to add fuel filters that offer protection as fine as 3 microns. Finer filtration requires a higher capacity fuel transfer pump - a task that the factory transfer pump is not designed to do. This forces the concerned owner to source an aftermarket transfer pump and filter system. We've had great success with the FASS pump-only units, so it was a natural progression to add their pump and filter systems. The Titanium Signature Series diesel fuel system Featuring there Revolutionary Whisper Technology is the Quietest System to date. A compact design with a very powerful motor. Manufactured to hold up to the most extreme conditions, our Titanium Signature Series system utilizes a motor that is capable of flow rates up to 95 gallons per hour and is durable enough that we back it with our Limited Lifetime Warranty on all light duty diesel applications. 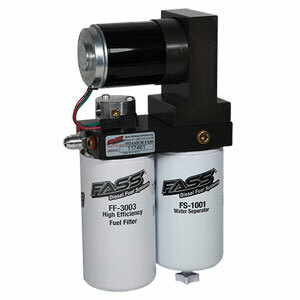 In addition to improved fuel flow, the FASS Titanium Signature Series lift pumps offer an advanced filtration method for your diesel fuel. Removing water, air and vapor in addition to debris with a filtration rating of 3 micron, far superior over your factory fuel filter. 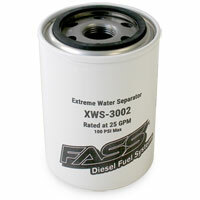 The added filtration will help improve your engines idle and extend the life of the injectors and injection pump. Each kit comes with a manufacturer LIFETIME WARRANTY.